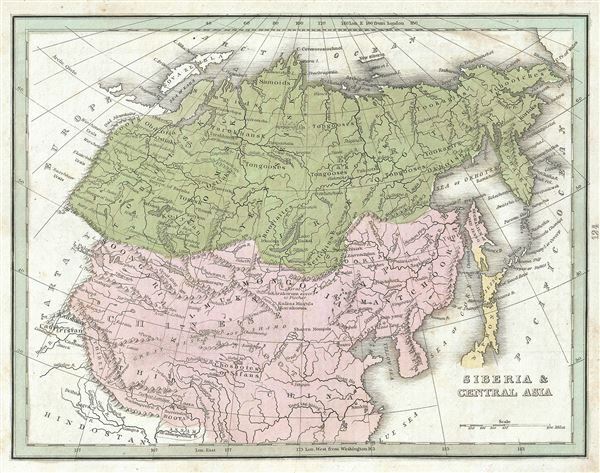 This is a fine example of the 1835 T. G. Bradford map of Siberia and Central Asia. Centered on the supposed site of the ancient Mongolian capital at Karakorum, this map extends from the Ural Mountains and the Caspian Sea eastward as far as Siberia, Kamchatka and Japan. It includes Korea, Mongolia, Tibet and the Chinese Empire. The Great Wall of China is identified. The sea between Japan and Korea, whose name is currently a matter of historical and political dispute between the two countries, is here identified as 'Sea of Corea.' Regarding the Mongolian Capital at Karakorum, Bradford deviates from the accepted D'Anville model, which situated the city on the Engui-Moren River, in favor of Fischer (Fischer, Johann Eberhardt, Siberische. Geschichte, St. Petersburg, 1768), who places it on the banks of the Orchon River. Throughout, the map names various cities, towns, rivers and assortment of additional topographical and political details. In the early 19th century Asia was coming under increasingly imperial European sway. By the 1830s oversaturation of the Chinese market slackened Chinese demand for most British products. To make up for the trade deficit, British merchants introduced Indian opium to Chinese markets. Addictive and cheap, Opium became Britain's most profitable and important crop in world markets, pouring into China faster than tea poured into Britain. Opium addiction and its attendant social ills reached such catastrophic levels that the Chinese government took action and destroyed British opium in Canton. As this threatened English commercial interests, the crown responded, sparking the Opium Wars of 1839-1842. The superior British forces took complete control of Canton, occupied Shanghai, and blockaded Chinese ports, forcing the Chinese to sign the 1842 Treaty of Nanking. This unequal treaty (the first of many between European powers and China) granted Britain extensive trading rights in China. The map was published as plate no. 124 in Thomas G. Bradford's 1835 Comprehensive Atlas Geographical, Historical and Commercial. Bradford's atlas, published in 1835 was an important work on many levels. First, it was one of the first American atlases to follow an encyclopedic format, offering readers extensive geographical and statistical tables to supplement the maps themselves. Second, it was published in Boston and influenced the city's rise as a publishing center later in the 19th century (at the time most publishing in the United States was restricted to New York and Philadelphia). Third, this atlas was the first to contain a separate and specific map showing the Republic of Texas. Fourth and finally, Bradford's atlas in some instances broke the Euro-centric mold regarding atlas production. Among other things, Bradford focused his atlas on the Americas and abandoned the classical decoration common in European atlases in favor of a more informational and inherently American approach.